Collection of the world’s most creative, innovative, and unique guitar designs. 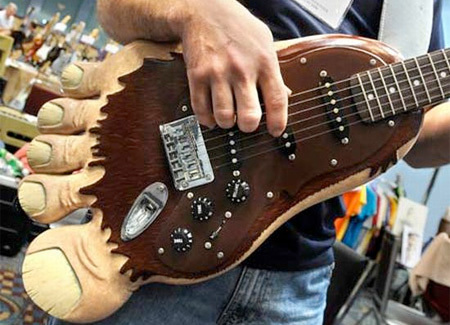 Unusual guitar created by famous guitar maker George Marlin. Innovative digital guitar comes with a touchscreen instead of strings. 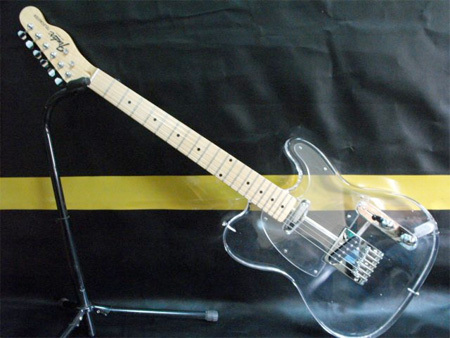 Cool electric guitar with transparent body by Fender GLASS. 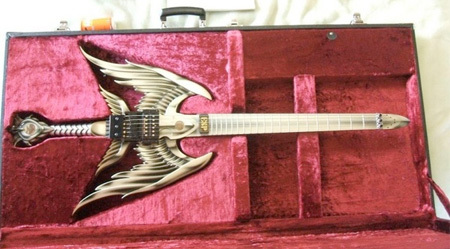 Amazing one of a kind guitar looks like a sword with wings. 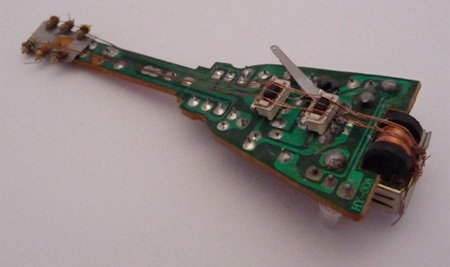 Kalashnikov assault rifle was transformed into an electric guitar. 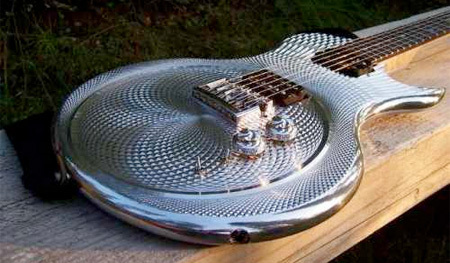 Stylish guitar with creative pattern is also covered in chrome. Regular shovel has been transformed into a custom guitar. 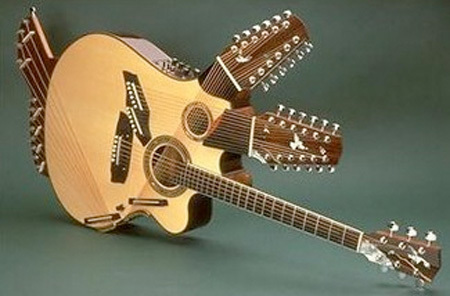 42-string guitar with 3 necks inspired by Pablo Picasso’s works. 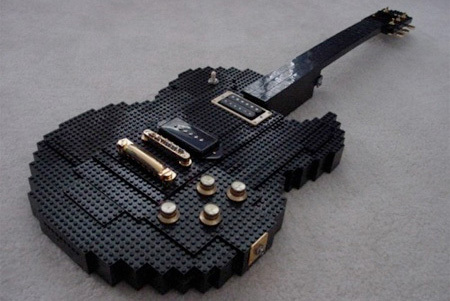 Playable guitar constructed out of thousands of LEGO bricks. 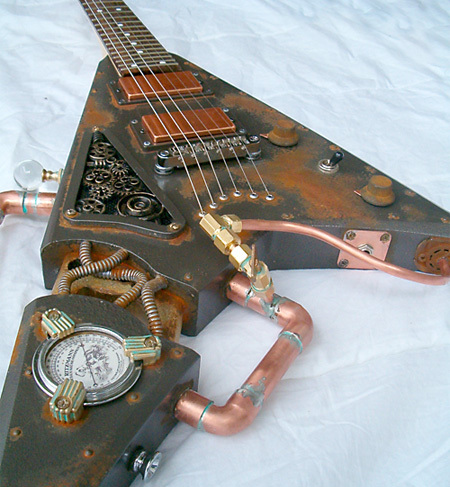 Villanizer custom guitar inspired by the Steampunk movement. I would liked to have seen Jimmy Fallon’s custom stained glass guitar on the list. He calls it the “Gathedral,” google it. 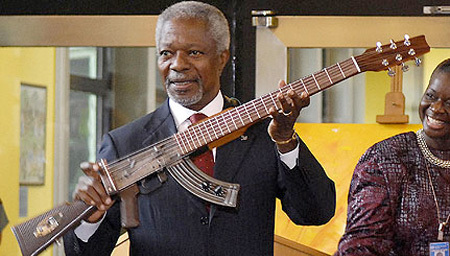 Um, that’s Kofi Annan, former UN secretary General holding that AK-47 Guitar. I think that one might just be fake. He doesn’t strike me as a rock enthusiast. 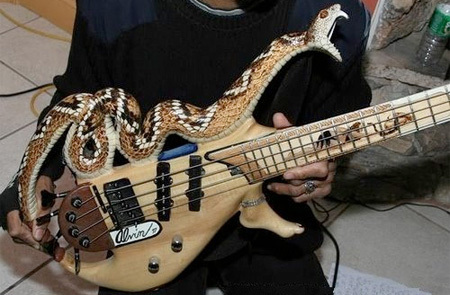 that snake “guitar” is actually a bass fyi. Took forever to make, but it was a great learning experience. In the process of designing a third guitar. The Picasso Guitar is AMAZING! These are all AMAZING!!! The touchscreen guitar sounds terrible, though..
@ yardbird: isnt a “bass guitar” still a guitar? It’s a bass guitar, so I think it still counts. Also, that clear fender isn’t so unusual or creative, there are tons of clear guitars out there. I like the Kramer ones w/ clear bodies and metal necks from the 70s! must want to play currently. @ yardbird. A bass is still a guitar FYI.